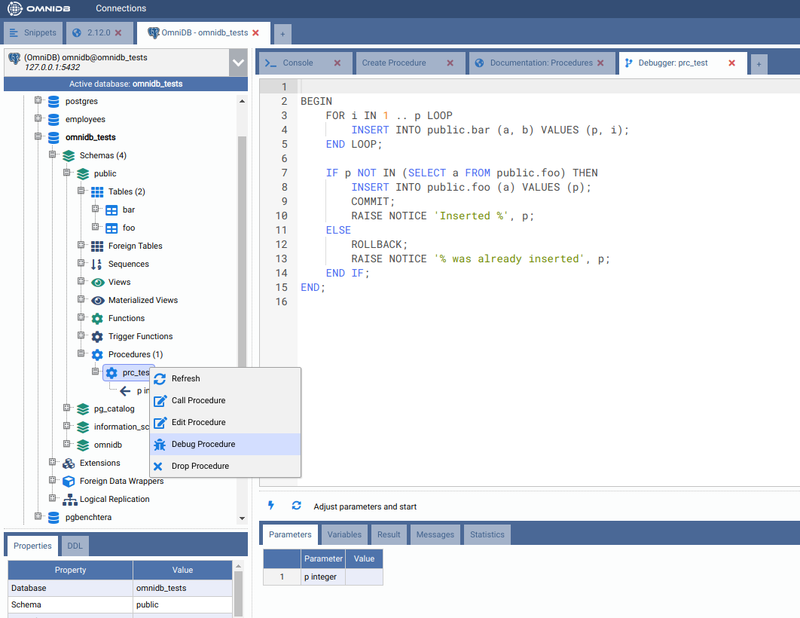 PostgreSQL 11 was released recently, with exciting new features. One of them is the ability to write SQL procedures that can perform full transaction management, enabling developers to create more advanced server-side applications. 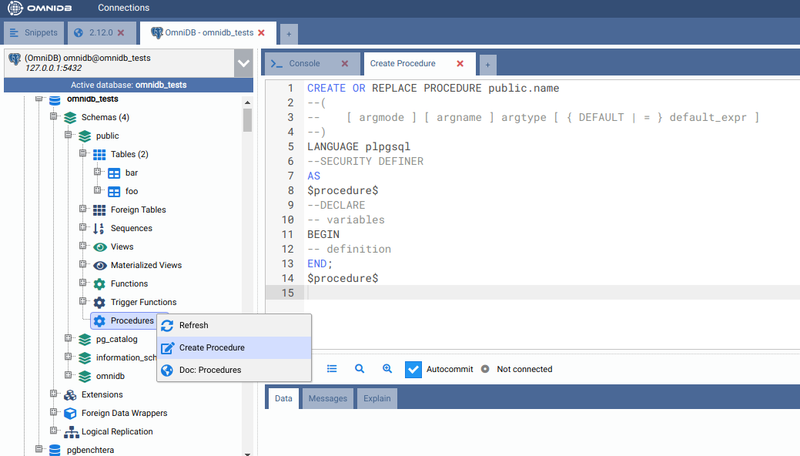 SQL procedures can be created using the CREATE PROCEDURE command and executed using the CALL command. Since OmniDB 2.3.0 it is possible to debug PostgreSQL PL/pgSQL functions. 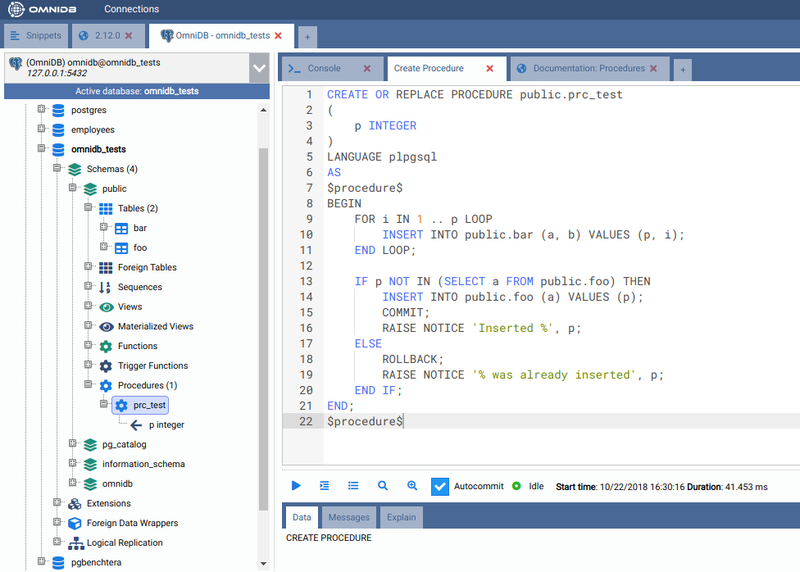 Support to PostgreSQL 11 functions and procedures was added in OmniDB 2.11.0. 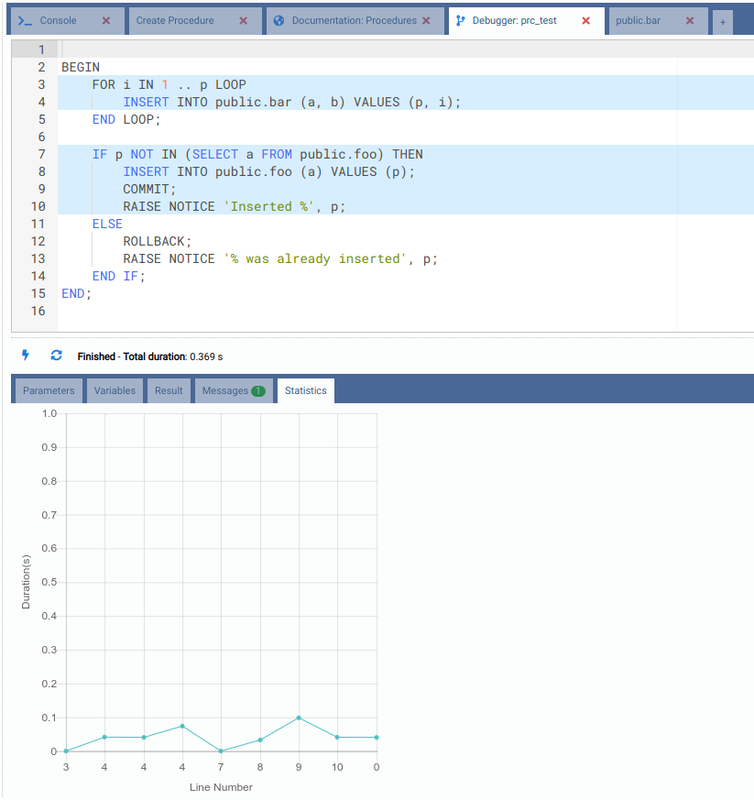 Last week we released OmniDB 2.12.0 with nice new features and a new revamped visual, so I’m going to show you how OmniDB 2.12.0 can debug PostgreSQL 11 procedures. First of all, if you have not done that already, download and install a binary PostgreSQL library called omnidb_plugin and enable it in PostgreSQL’s config file. The debugger also uses a special schema with special tables to control the whole debugging process. This can be manually created or with an extension. For more details on the installation, please refer to the instructions. 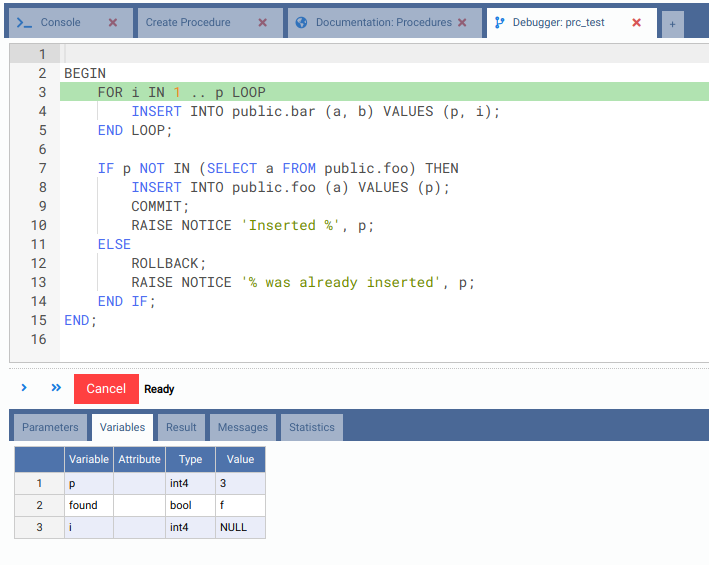 You can also refer to the documentation about the debugger. 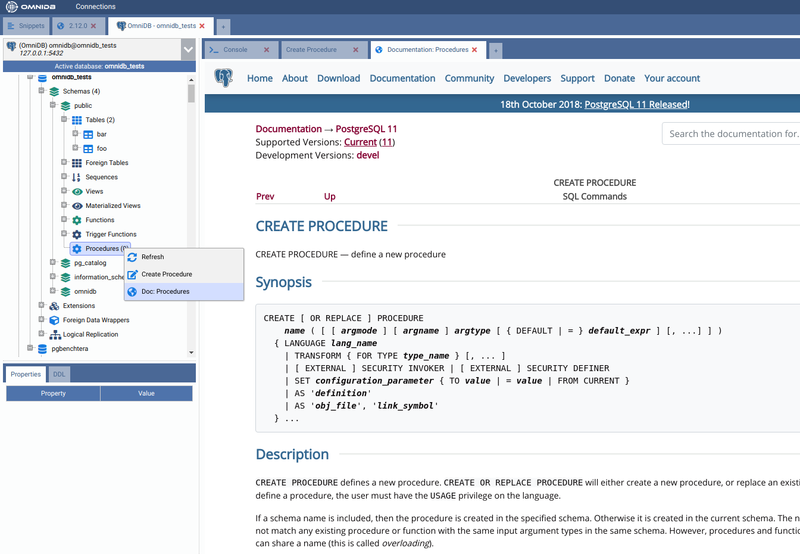 Note that OmniDB has a Procedures node in the tree view. Right-click on it, then click on Create Procedure. 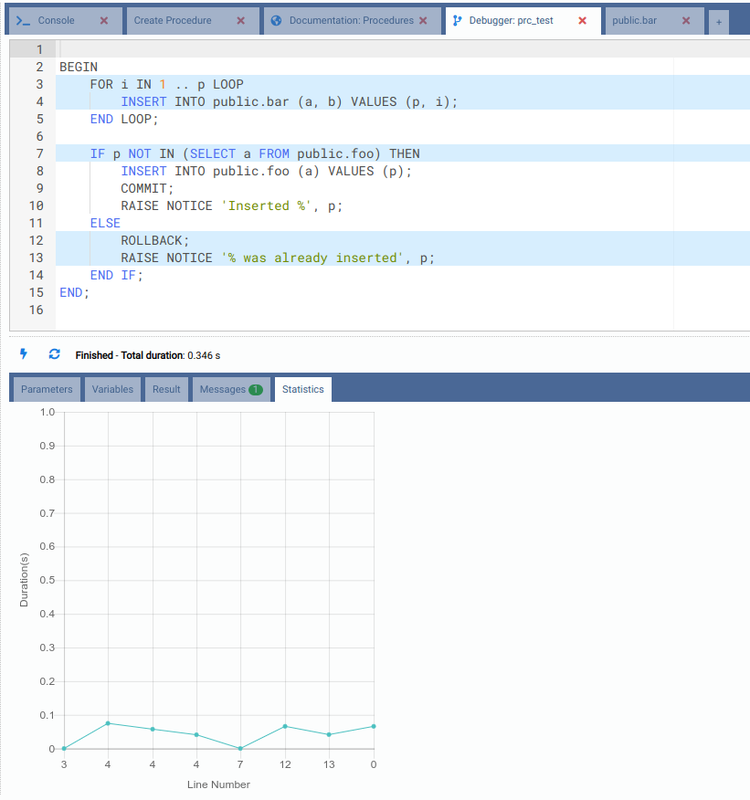 It will open a Query Tab with a SQL template showing basic SQL syntax to create a procedure. 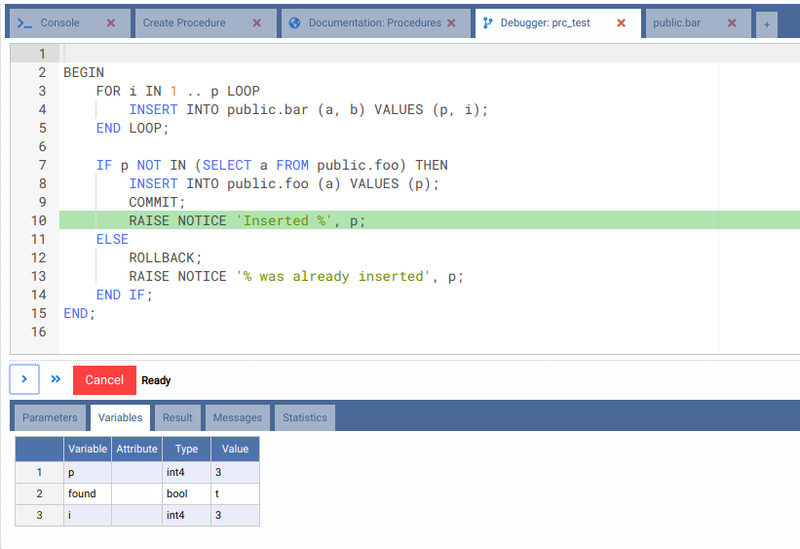 To open the OmniDB debugger interface, right-click on the procedure and then click on Debug Procedure. Now fill the value of the parameter p, for example 3. In this case, when PostgreSQL executes the COMMIT, we will be able to see data in both tables foo and bar even before the procedure finishes its execution. Click on the lightning button to start debugging. The debugger will point its cursor on the first command and you will be able to see all variables. By clicking on the right arrow button (Step Over), you can watch PostgreSQL executing statement by statement. You will see it performs an INSERT 3 times on the table bar. But if you run a SELECT on this table, you will see it is still empty. Now advance the debugger until it performs the COMMIT statement, then try fetching data from the bar table again. The procedure did not finish its execution yet, but thanks to the ability of the user to commit everything that was done so far, you are able to see data from a different backend. Now advance the procedure until the end. 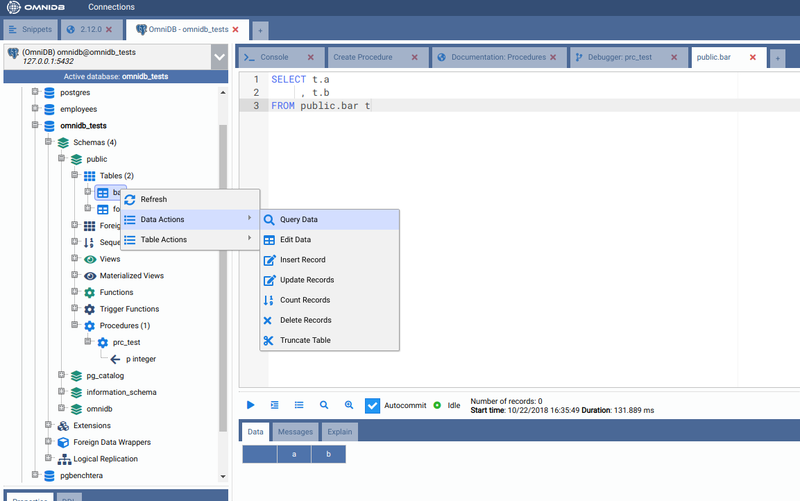 What’s new about Barman 1.4.0?